This is the 3rd round of babies to arrive since May. The first time around we didn't see the parents switching places on the nest, but since then we have seen the parents change their shifts of sitting on the nest. It seems that the dad is thinner than the mom or has a longer neck? It is amazing how they will not leave the nest once the eggs are ready to hatch and when the babies are born. Before the eggs hatch, they do fly off when we leave the house. The nest is just a foot from our den window and about 2 feet from the front door in my hanging plant. I thought by now they would be have become accustomed to us. Sometimes I'll leave a little pan of water for them but not sure if they use it or not. Our baby doves left the nest about 8 days ago. They have stayed in our courtyard since then. They hide behind a large pot. They come out towards evening and sometimes fly away but are back the next morning. I gave them some millet and they chase away any other bird. They have a fountain to drink from. Is it normal for them to decide to live in my courtyard. I believe their mom has begun to nest again there. We have a Mourning dove nest upon our wooden fence shielded by a hedge on it's third two chick brood. The previous two broods successfully left the nest. I saw them flying away. Yesterday I noticed no chicks in the nest, and momma was not around. And, there was hard evidence that a chick had been eaten/attacked by a predator of some sort. I'd guess they are/were about five days old. This morning I saw momma and one chick in our side yard hanging around the trash cans (to hide by?) about thirty feet from the nest. At first the chick was on top of a trash can, and momma was close by. Just now, the chick is on the ground. Do think this is a case of the chick learning to fly? Or, should I return it to the nest? Or, do you think the predator will return to the scene of the crime? I've close off the side yard to keep our dogs away. No one can say whether the male would have finished or not. What you did was a good decision. It's difficult for a single adult to raise young alone and often the males don't do a great job. Feel good about your decision. Mamma bird died in nest..
We have been watching a morning dove that made a nest on our neighbors hose holder right outside our window. I never would have expected that they take care of the birds together... Anybody know more about this? Would the baby chick survived just by the care of the Male? They will indeed drink the water you leave out for them. They come to our birdbaths daily. You can go Amazon.com and buy a crow decoy. It costs about $24.00 and is covered in real crow feathers. If you hang the crow decoy upside down with the head towards the ground, no crow or hawk will come near the dove nest. If you don't want birds on your property, then hang the crow decoy right side up. It comes with black strings attached on the head and at the tail to hang in which directions meets your objective. Sounds like a Sharp-shinned Hawk or a Coopers Hawk. They tend to pluck the feathers off before taking them back to the nest to feed to their young. Dove squabs that have recently fledged sometimes stay on the ground for several days. This makes them ideal targets for many predators. We live on the second floor. I have seen a couple cats, there are hawks and plenty other birds around. On our back Veranda, which is fairly secluded, we have a fridge. A pair of doves made their nest and had two chicks. They were pretty good size but hadn't started flapping wings yet. They stayed like statues when parent left them which had been more and more often the last few days. Leaving for a couple hours at a time. When I went to get something from the ice box (The mother wouldn't fly away when I came within a couple feet-got used to me to a certain extent) the chicks were gone. At first I thought they were being taught to fly but since there are lots of nests now, I looked at a couple the same size and they hadn't took off. Anyway, I noticed the parents seeming to look for them and I saw her keep looking at one spot on the cement floors corner. There were about 10-15 baby feathers that look like they'd been pulled out in a little pile. There were so many that at first I thought it was a chicks tail hiding behind a earth bag we have in the corner of the veranda. Any Ideas of what may have happened to them? Since they stay on the ground after fledging sometimes. That makes them easy targets for cats and other predators. They also move up to trees, so yours may be fine. The male continues to check on them after fledging and trains them to find food and learn about predators. This time period may last a week or two. We made a wood shelf under our front door awning. Mr and Mrs sat for weeks on one or two twigs! All of a sudden there were two huge "babies". A week later, the babies are gone and Mr and Mrs seem to be sitting for the next set. Im worried about where the babies are. There was a bird-like skeleton on the driveway recently....could have been one of them unfortunately . Lots of cats and grackles around. Better luck with the next clutch hopefully. The past 5 weeks a morning dove has been nesting on two white eggs - yesterday when I came home the dove and eggs were gone. I have a nest on my house with two eggs. the parents sit on the eggs and have been sitting on them for almost 4 weeks. I can see the eggs and nest from a window. sometimes both parents are on the nest. since it is well over 2 weeks can I assume the eggs will not hatch? why has it taken so long? can the parents sense the eggs are dead? 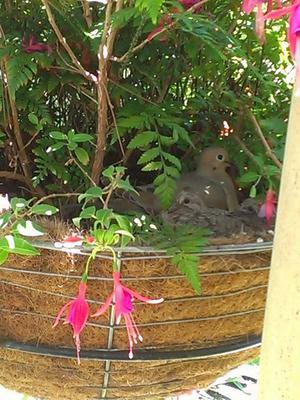 I have a planter and Mr. & Mrs. Dove made their nest in them, Palm Sunday eggs were laid and soon hatched. They did not mind me watering plants or taking pictures while they were nesting Palm & Sunday as they matured. As a matter of fact he/she would step off the nest allow photo and then go back to nesting when I stepped away. While I was gone for the weekend Psalm & Sunday flew and the nest was gone for three days. Now a new nest and new nesting is occurring. Do Dove's normally take their nest away so the young will not return? If so, do they rebuild a new nest or reassembly the old? My husband picked a baby up off our dirt driveway in the scattered remains of a nest as our German Shepherds had just located this debris and were sniffing curiously. We've kept it alive for a day and a half, trying different things. He finally ground up chicken pellets and mixed it with warm water, and this snuggly little guy went crazy for it. It's passing solid and liquid waste, eats and sleeps and gives more whistles before feeds and less to none afterward. It can walk and perch but not fly. It has real feathers fully on its wings, but fluff on its head and back and underbelly. My husband, the farmer, says it has no chance but we are trying. Any advice? I have a mourning dove nesting on my front porch light fixture so I can't turn on the light for fear of overheating the nest. I will allow this nesting to come to a happy ending but please let me know how to keep it from recurring as I need to light my doorway at night. Each year morning doves build a nest on an arm of my Saguaro in my front yard. Two babies have hatched, so far, this year. They have stayed together, on the ground, after leaving the nest, near where the nest is. 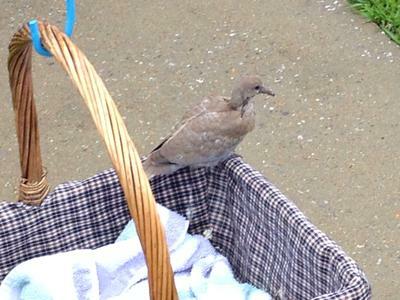 After about 10 days a third dove has appeared with them, but not as cosey as the first two. All about the same size. Was this a survivor of another pair looking for friendship? 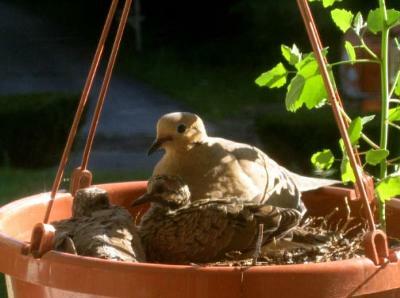 ahhh we too had mom and dad doves sitting on 2 eggs, on a hanging planter, we were so excited to see the hatch-lings and one evening while we were in bed there was a horrible commotion outside and we heard the basket swing back and forth hitting the house. The next day, eggs were gone. We have a 2 door garage with brick between the doors. As a libra he has collected the old style scales and hung one on the brick. We usually have doves around each year, this time on one side of the scale. Glad to know they alternate brooding because we were worried. My husband can open the garage doors, start the riding mower, his motorcycle, and she doesn't get frightened. 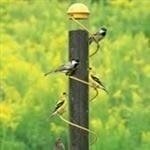 We are guessing they have nested in the area before and are used to people and noisy work. Join in and write your own page! It's easy to do. How? Simply click here to return to Mourning Dove Invite. My husband and I have a small enclosed backyard, quite safe from roaming critters (except my harmless Maltese, "Ivan"). For the past few summers, a pair of doves come to sit on our back fence each morning. Last spring, a pair of doves nested in the "dead-end" of one of our rain gutters. The doves sat on their nest through the wind, rain and weather. Since the nest was out of our sight, I don't know if they successfully reared fledglings. 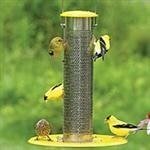 I have an old, covered, weather-beaten bird feeder that I fill each summer. 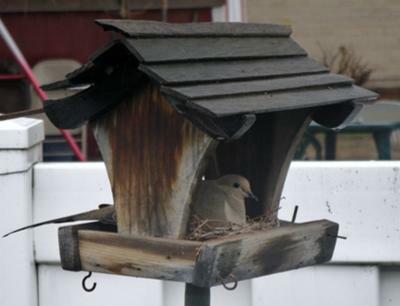 In mid-April, I noticed it had an occupant...a mourning dove! Perhaps it is the same pair as last year, but this year they have nested in a "sheltered" facility. It is a good thing, since this spring has been especially wet, windy and cold. They don't seem to mind my photo sessions (of them) and gardening in the yard below them. We have been treated with a great view of the nest and are able to keep an eye on the parents and chicks. The feeder is only about 10 feet from our back door and 7 feet off the ground. 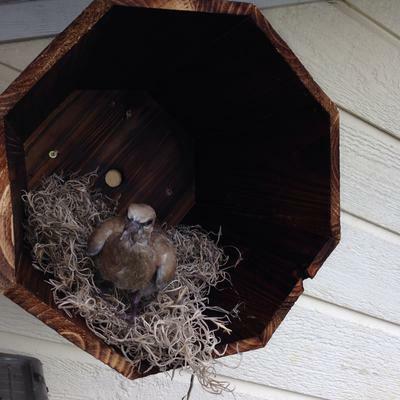 This has been our first experience with nesting mourning doves; it's fun and pretty exciting. My mourning doves' nest is in a hanging flower basket inches from my window, so I have had a grandstand seat to watch them. This morning the babies are trying to flap their wings, and the mama looks so puzzled! Then, for the first time, I saw her feeding them. The 2 little heads poked their beaks into her mouth, and for several minutes the three bobbed up and down in unison as I suppose the mother regurgitated food for them. I did see the changeover when dad came to take over the nest for the day. At first, he flew away and faked a broken wing to distract me when I went out the door only 2 feet from the nest. Lately, both adult birds tolerate my watching through the window and passing through the door to water my other plants or sit on the patio. What a lovely sight they have been. How amazing that they have the instinctive knowledge to do what they do and to wait so patiently for their children to grow. Surely God will teach me what I need to know for today. Let me be patient in letting things develop and proceed naturally. For the last 2 years we have had a pair of doves arrive at our house and try to build a nest on the arm of our sky dish. And each year they do not complete the task as the bar is not wide enough to hold the twigs. This year we witnessed them making their nest and again they had no luck. So my husband cable tied a wooden dish on to the bar and they have been lucky this year as a few days ago I saw a chick in the nest. So we will leave it there once they leave and hopeful they will return for the fourth year and be successful again. I watched the birds searching for a place to nest. Usually right above the sliding door where there was a slight ledge. I knew a nest would never stay because it was too narrow, so I bought a soft edged small wicker basket. Climbed up to ledge secured it by nailing it to wood which kept it very secure. Sure enough a pair of Morning Doves came back and have occupied this "nest" It is too high for me to see if eggs are there, but the doves have been nesting going on 2-1/2 to 3 weeks. How long before the eggs hatch (assuming there are eggs)? We go in and out when necessary..including my Labs but the doves seem unconcerned which makes me happy. Completely enjoying this journey and hope for many more years. 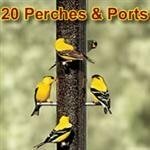 So interesting and informative; learned alot about this precious bird and its nesting habits. We live in a second floor apartment with a balcony facing a large shade tree with its branches and leaf clusters comming just over our balcony raillings, and for the past three years a pair of doves have graced our balcony view. It is early September and they are nesting within inches of our raillings. Two weeks are upon us now and we are anxious to see new life at the nest. I can hardly express my gratitude for having learned so much abouy these seemingly people friendly birds: Thank you. 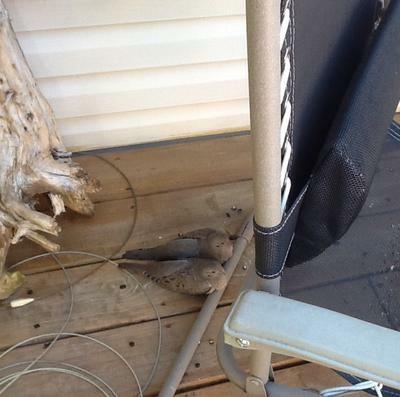 After the two doves fledged & left the nest (I thought for good) they came back again w/the female? or male w/them in the nest. They seem to be using the old nest as a hotel. There is now only one fledgling. Have you experienced this? A dove is nesting on our topiary tree on our balcony. We have been concerned because she never left the nest. This morning we were surprised to see two birds . One soon flew away. What a relief to know that bird was not alone in this task. Almost every year for the last 8 yrs., doves sit on the telephone wires and look at my porch. Some years they nest in my Staghorn plants. I tried to discourage this by putting sticks and other things in them. This year I went to one of my empty hanging baskets and was almost hit my a dove fleeing. It's about 8 feet off the ground and under a porch where my orchids hang. I now watch it carefully since I have two Dogs. Hi - the first set of babies flew away in about a week's time. We coudn't see them at first and then started seeing feathers underneath the parents. The parents seem to puff up to cover the babies when they are hatched. After a couple of days we started to see their faces, and then they were out from under the parents. My goodness they grow fast!!! In about a week they huge and flew away. But less then a week later, there were 2 more eggs! I don't know if it's the same birds or different birds. The nest is really close to our front door and the parents tend to fly away before the babies are hatched but once they hatch, the parents don't move from the nest. But the same thing, eggs hatched in about 2 weeks, and the 2nd set of babies are now here! So much fun! Pregnant feral cats love doves. It breaks my heart to see doves caught. Doves are too slow in flight when they leave the ground. That explains a lot. I've been watching a dove nest with binoculars, just a nice distance from my dining room window. I'd see baby birds, they'd fly & a bird still sitting on the nest. They are fascinating to watch. By this time of the summer, there's a whole line-up of them on the electrical wire along the alley. I've seen a family of 4 or 5 line up on my fence in the morning & get in a circle & it appears that they're all kissing each other good bye for the day, then they go off on their own & reunite in the evening. Just like people. God's creatures are so amazing. Should I leave or stay?? 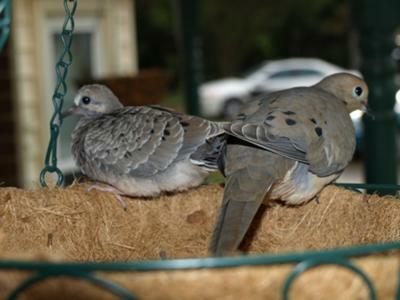 These mourning doves have been such a joy but now they have grown so that the joy is leaving by this weekend. I have written before about my new found friends so will leave that and just give you the picture that I took this past evening. For the second time this season we have come home to our hanging basket where our momma dove and her babies were to a mess underneath and everyone gone. They were not old enough to fledge. She used this same basket last year with no mishaps. Do you think maybe a hawk or an owl is getting them? I am so upset. Both times this happened we were gone all day. I don't know if the lack of activity made the predator bolder or not. Any ideas of what happened and what we can do to prevent it happening again? 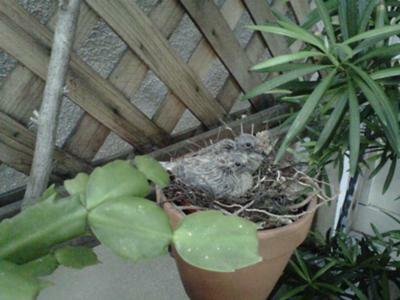 The nest for these doves must be in our garden somewhere and the parents are no longer around. We feed them daily. 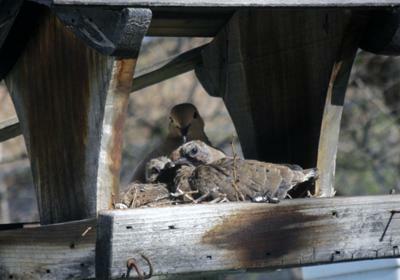 I had submitted a story with photograph yesterday that showed a Mourning Dove male sitting on the nest with a baby. I had indicated that I would love to see if there were indeed more babies in the nest. That opportunity presented itself later in the day, when while walking through my yard, the male flew off the nest. I noticed then and there that two babies were in the nest! I was excited, to say the least. I ran into the house to grab my camera and took this photo of the babies without the parent present. I think it's a good thing I did, as I don't think they will be in the nest much longer. I will be anxious to see if the nest is re-used this season, as I've read that sometimes it can be. Greetings. We are proud to say we have fledged many, many chicks from our yard over the years, which of course means we have also seen many nests raided and the babies snatched away. We have always assumed the culprits were cats or rats since the scene involved major disruption of the nest and feathers everywhere -- and indeed it may have been such predators -- but over the years we have in fact discovered that other bird species are the most likely culprits. Crows often prowl our yard, and we were shocked (and amazed and even somewhat delighted as birdwatchers) when we witnessed a coopers hawk swoop in one day and inspect everything (no nests then). 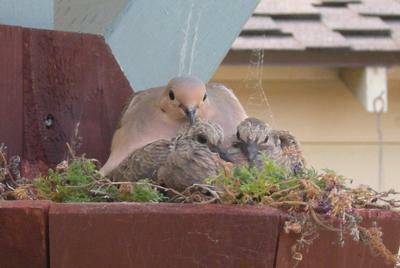 Then, about a year ago, I observed another dove -- of all things -- brutally harassing another parent dove doing its best to sit on its nest and tend its babies. The attacking dove stood on the nesting doves back and ripped feathers from it until the mate returned and fought off the aggressor. This made me wonder if anyone has ever seen another dove raid a nest and carry off or kill the babies. Anyone? Then this: Last week we had a pair with very young chicks on a nest they had used already this season to fledge two broods successfully. The nest is supremely concealed, about three feet off the ground in a flower pot mounted on a low fence. It cannot be seen from above or on three sides, covered by many low hanging branches and boughs, but it was an ideal place for our observation; we often sat on a bench just three feet away, where the parents and chicks calmly tolerated us. Unfortunately we awakened on Saturday to find the chicks gone… but there was no disturbance to the nest at all -- no feathers, no down, not a twig out of place -- and there was no disturbance to the surrounding foliage or groundcover of any kind. Though in past years we have seen cats and even rats on patrol, that’s been so very long ago we discount the possibility this time, especially in light of the fact that there was not a twig out of place. The one thing my sharp-eyed wife did find on the ground was the two crops or livers of the babies, as clean as if they’d been removed by a surgeon and washed for research -- but not another bit of debris or carnage or disruption of any kind. Of course we are skeptical, and of course it’s natural to assume another form of predation, but the scene is so perfectly intact -- as if the parents and babies had simply flown away by choice (minus the crops/livers) that we just can’t figure it out. We’ve set our trusty traps for rats (catch-and-release, of course), and we keep our eyes peeled for cats (even our neighbors say they haven’t seen one around in years), and we are confident no larger bird can detect the nest, but we are open to all suggestions, especially from anyone who’s had a similar situation. For years our pair came to nest under the eaves on our porch. I always believed they were the same two or maybe the babies from previous hatching. Last week the nest was built and both took turns sitting on 2 eggs daily. It looked like we were going to have another generation of these beauties until yesterday. I woke to find nest on ground and feathers everywhere. Looking into security camera footage I see mama come down from nest at 2am to sit on porch bench only to be targeted by my neighbors house cat. Unfortunately in her panic she flew into house, window, and roof never able to get a grip or fly out from under porch into the darkness before she was swatted to the ground and carried off. Dad has been cooing on top of our roof for 24 hours now :( I can hear him as I write. I have read that when mother duck fears its nest is in danger of a Predator it will fly down and pretend to have a broken wing to distract it away from her eggs. I understand the circle of life but I will never understand pet owners who keep their pets in the home all day and let them out at night. I have 2 babies on my balcony in a flower pot and they are now getting ready to fly away. Every year they come back. 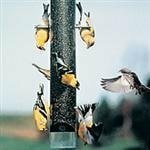 Response to: "Mysterious Nest Raid"
We were looking to see if anyone had a similar experience to ours. We, too, were infatuated with the beautiful wonders of Nature, until...! We have two nests in our Cereus cactus. 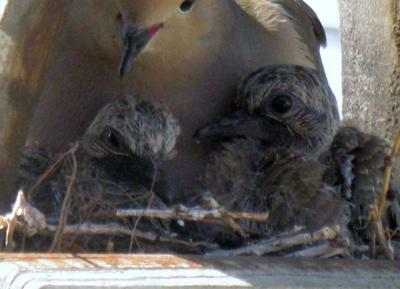 Two dove couples were brooding, and one couple was successful with one egg. After the parent had been tending to the young chick for about three days, we saw the dove from the other nest suddenly fly out of its nest and attack and chase off the other parent and the young chick. It would not allow them back into their nest. The chick was not old enough to fend for itself, and the parents seemed incapable of protecting it. Next day, we saw the chick on the ground next to the cactus. The other dove flew down and attacked it with claws and beak, drawing blood. Yesterday, we found it dead next to the patio. Any bird psychologists out there? Last week we noticed a dove flying around our garage door --when we pressed the automatic garage door opener when we went out to get the mail. The dove flew out and we noticed the semblance of a nest on top of the garage door opener at top of motor. Later we noticed the dove was back sitting on the nest. We are leaving the door open as long as we are in the area to enable her to fly out for food and water. We have noticed another dove around and a smaller dove also. We don't want to disturb the nest but can't leave our door open at night etc. any suggestions would be appreciated. We have named her Molly. Doves Giving Me An Education! We came back from a vacation, and was catching up on the yard watering when we discovered a dove nesting in one of our wall mount planters. We watched for about 16 days, with the "changing of the guards" each 12 hour period. Two eggs produced two babies. The babies grew up very fast, flying out of the nest after about 8 days! They were in the yard on and off for about 5 more days, then headed out. Now the mom is back in the same nest with one more egg. Such fun watching. 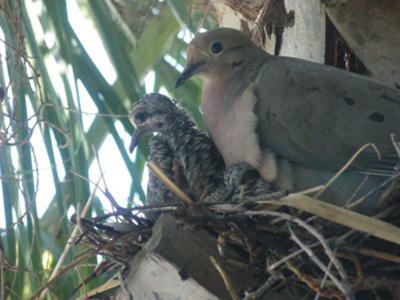 Mourning doves nested in a Sabal Palm tree right outside our second floor office window. The female picked a great spot facing our window and sheltered by the building and the fronds of the palm tree. It was shady and out of sight from predators. We had a perfect view of the birds and their chicks. I took pictures every weekday as we watched the little family grow. We were able to observe the parents switching positions on the nest each morning and the female providing food to the chicks from her mouth. While one parent was on the nest, the other was perched on a nearly light pole keeping guard. At first we saw only one eggshell and one chick, but it soon was apparent that the second chick was just hidden a little from view. The two chicks grew so fast right before our eyes and after a while, they barely fit in the nest. We came into the office one Monday morning to find the chicks gone and the female preparing the nest for a new brood just a few days later. I had started feeding a pair of doves in the parking lot about a year and a half ago. One of my co-workers also feeds them. They have gotten to know me and they fly down to my car when I pull in my spot in the morning. They also spot me when I come out of the building before I get near my car and fly down in front of my feet. I feed them black oil sunflower seeds and they now let me get really close to them during feeding. We believe that the nesting doves are the same ones we feed. I noticed that only one dove at a time was feeding in the morning just about the same time the nest was built. At first I was concerned to see only one dove, but then it made me happy to know that our little mated pair was still together and well and raising a family. 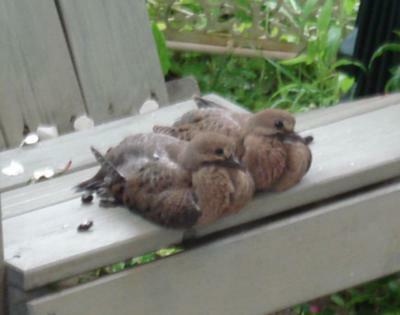 Several weeks ago I came across a baby mourning dove in my backyard. The neighbors dog was after it but I grabbed it just in time. I brought the dove in the house, and began nurturing it. I fed it baby bird food with an eye dropper and then I was feeding it from my hand and the bird thrived to the point of eating out of my hands and also between my fingers. All the time, I would talk to my lil dovee and it would shake it's tail and coo as though it knew what I was saying. I kept it in a bird cage with water and seed, but continued hand feeding it 2 to 3 times a day. Then came the day that I dreaded, I knew it wanted to leave. I brought it outside and at first it didn't want to leave, but eventually the baby dove took flight to a tree that was close by. That was about 3 days ago. Every day since, the dove has returned to eat bird seed that I have in the back yard for all the birds. 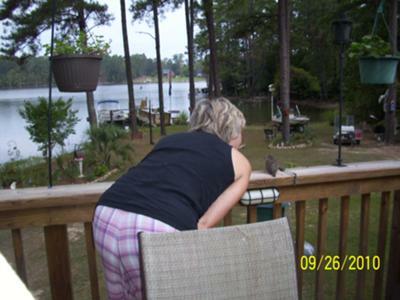 This morning was the best, the dove flew up on the railing of my deck while I was having my morning coffee. When I approached it and spoke, it flapped it's wings and cooed as if it still knew what I was saying. My husband, in disbelief, ran and got the camera and took a few pictures that I've posted to share with everyone out there. 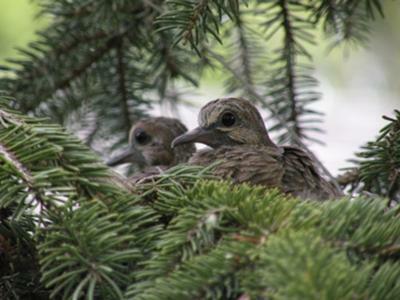 I have a pair of doves who have nested twice this year in an abandoned nest in a tree. I have enjoyed them so much. I read about doves quite a bit to understand their behavior and what fun to learn about them and share with my granddaughters. Today I can clearly see the babies. I just found your article and pictures dating back to 2010. It was wonderful and completed my own little adventure. I was just thrilled to see your baby come back to visit you. You did an outstanding job caring for them but also allowing them to mature at their own rate. 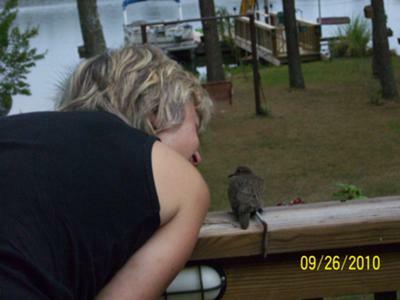 It is delightful that the baby flew back to your deck to visit. Makes me wonder more and more what the birds actually know about us humans. It seems they clearly responded to your kindness. Thanks for sharing your story and your lovely pictures! Your photos are wonderful and your story is even better, thank you sharing and helping the little baby! We are on our second brood of the season and I am so grateful how much I've learned and get to see everyday. I coo and whistle to my doves and they are unafraid, I also speak to them a lot, not sure what they think of my cooing but its fun. A couple of days ago my neighbor rescued a baby Bluejay and he is hand feeding it every 45-60 minutes, speaking to it often and she loves it. They communicate well it is really fun, not sure what will happen after it flies off but am learning so much about life everyday. My son's friend brought me a baby dove...did not know what it was in the beginning. He did not look good at all, and truly did no think he would make it. 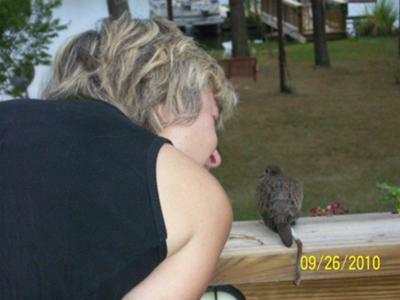 I took him outside daily and put Lovie on the ground under my bird feeders to see what he would do. The first time, Lovie stood there for about five minutes, turned around and walked right to me. I knew I was in trouble!!! I've been caring for the little one for about 3 weeks now. He is still an outside bird. He has a fenced in area in our backyard. My daughter goes out a few times a day and "plays" with him. When I go outside to check on Lovie, he either flies on top of my head or my shoulder!!! We just love having him around. I think he loves on me...not sure of some of his behaviors. He's just too darn sweet and cute!!!! I hope I am doing the right thing. I could not keep him in the house. I do think we have made him a comfortable place outside. He has his own birdbath, house, and feeder. Any suggestions would be helpful!!! Sad to say our little Lovie has left. I was really expecting him to come back since he was so attached. I truly hope nothing has happened to him. I found this site as I was searching to see if there were any posts on baby doves returning to the nest. It seems from some of the posts they do. I can't be sure it's one of the babies that flew away about two weeks ago but, it doesn't look like an adult and there doesn't appear to be any eggs so far. We love having these peaceful birds in our yard. I went out to cut the grass on Sat and noticed a mourning dove sitting behind my butterfly bush. I figured it would just move off once I started moving around, so I continued to ready my task. I was picking up a few things and was just about to get the lawn mower when out from under the deck comes another mourning dove. Neither one of them appeared ready to move. So needless to say I abandoned the idea of cutting the grass so as not disturb them. I just figured they would be gone in a few hours. It is now Sunday and the pair of birds is still hanging around my yard. Last I put out a bowl of water. I also put out some sunflower seeds. I am not sure if are sick or hurt or what. This morning when I got up I thought of the birds. Are they gone? So out I went. I walked to the end of my deck and looked over on the ground and couldn't see them in either corner. Oh good, I thought, they flew away. When I turned around, there they were on the railing. Sitting right there, not afraid. I went out to take a picture of them and thought once again perhaps they were gone and found them huddled together under one of my lawn chairs. I am puzzled as to what do. Can I get some help, I don't want any harm to come to them and we have Ferrell cats around this area. Help! Many have had luck watering the edge of the plant. Make sure not to get the nest or eggs wet. Move slow. I'm scared to death of the morning doves in my Boston ferns. I live on the second floor of my apartment complex. They started nesting about two weeks ago... I haven't been able to water my plants and in this Alabama heat they are slowly dying. I want the doves to have a home to raise their babies but I'm afraid they to will die if the shade from the bush subsides,... What should I do? Your doves are most likely juveniles from an earlier nesting. The young may be on the ground for more than a week before leaving. The adults will continue feeding and teaching them what they need to know to survive. Yours haven't learned to fear humans just yet. Other than trying to keep hawks and cats away, there's not much you can do.